Cincinnati is certainly judged by its chili. Some claim it's not even chili, but those are just fighting words to natives who have developed the crave. Cincinnati is a long way from El Paso, and our chili is not Tex-Mex style. It is a unique blend typically served as a three-way: over spaghetti and covered in shredded cheddar cheese. 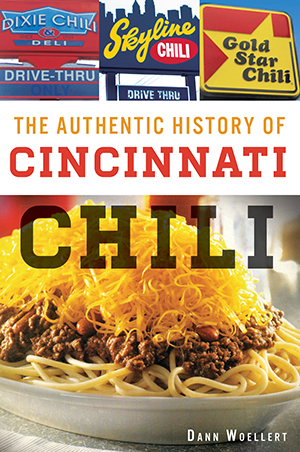 From its 1922 roots with the Slavic-Macedonian immigrant brothers Kiradjieff in a burlesque theater, Cincinnati chili has become a million-dollar industry supporting 250 chili parlors. Many chili parlors have come and gone, but a few familiar names remain: Dixie, Camp Washington, Gold Star, Price Hill and Skyline. This is their amazing chili story. Cincinnatian Dann Woellert is a member of the Campbell County Historical Society, Norwood Ohio Historical Society and Taft Museum of Art. He gives tours for Architreks and the Cincinnati Preservation Association. He's published Cincinnati's Northside Neighborhood with Arcadia in 2009 and The History Press's Cincinnati's Turner Societies in 2012.